his is a pound cake-like loaf. Without frosting, it carries easily to picnics and reunions. It freezes very well; I slip 2 slices apiece into small freezer bags so they thaw while you make coffee. 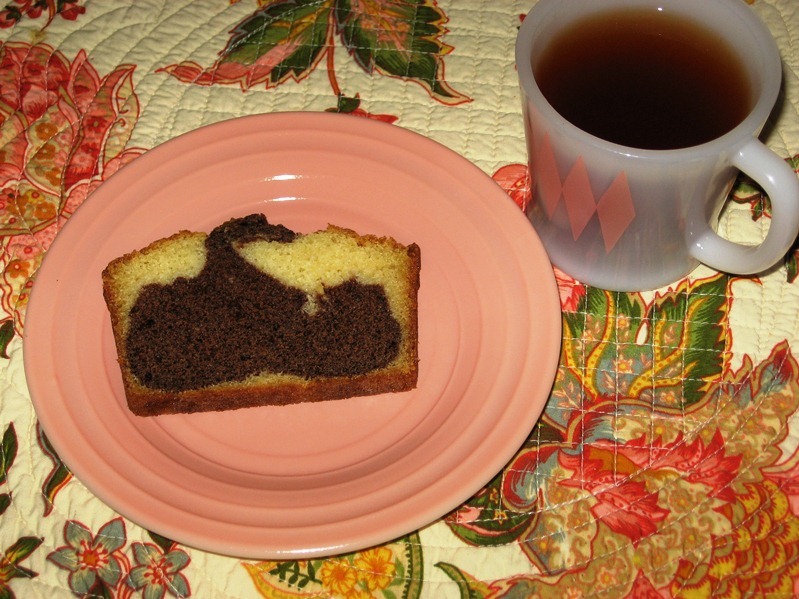 This is my personal favorite cake; I found the recipe in a 1980 Robin Hood booklet, Home Baking with Robin Hood Flour. Prepare a loaf pan. Grease the bottom and 1" up the sides to prevent hard shoulders. If possible, cut a piece of parchment paper to fit, leaving ends for handles. Grease like the pan. Mix sugar and butter well, beating in the eggs, then the heavy cream and sour cream and vanilla. Mix dry ingredients, then add to batter alternately with milk, by hand, until smooth. Mix the rest of the batter with cocoa and pour on top. You can just leave it or run through it with a knife, zigzagging once. Bake about 45 minutes for loaf pan, until toothpick inserted in center comes out clean. Check for doneness before the time is up – a toothpick should just come out clean. Don’t over bake – it will be dry. The internal temperature on an instant read thermometer is about 180°. Cool in pan for 10 minutes before removing. Dust with powdered sugar when cool. This can be baked in a 9x9” cake pan for about 35 minutes. Cool on a rack for several hours, then overnight in the refrigerator, well wrapped, before slicing. Per Serving: 223 Calories; 12g Fat (47.5% calories from fat); 4g Protein; 26g Carbohydrate; 1g Dietary Fiber; 66mg Cholesterol; 193mg Sodium. Exchanges: 1 Grain(Starch); 0 Lean Meat; 0 Non-Fat Milk; 2 1/2 Fat; 1 Other Carbohydrates.